Hopefully the seasonal icon of your choice will soon be bringing me a pair of road shoes and some Shimano clipless pedals. I find this concept so exciting that I've become giddy enough to resort to awful puns in my titles. I've always wanted a bike with two things: clipless pedals and an STI groupset. With Tiagras selling for nearly £300 the latter is going to have to wait, but the former should be a reality by January. 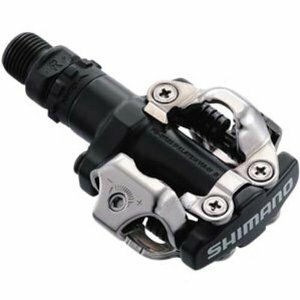 I've actually had clipless pedals before, so I have some experience of the cycle of increasing the spring tension, falling over sideways, getting used to the release mechanism, tightening the spring tension, falling over sideways, getting used to...and so on. Having said that, it's been a long time since I used them, the shoes having disappeared in one of the many Uni and post-Uni house moves I've made. I'm fully expecting to be very rusty and to pick up a few new bruises. The funny thing about my last set of clipless pedals and shoes was that I'd blagged them off a friend, a mountain biker who'd broken his back so badly that he was half an inch shorter when he healed. He didn't want his bike, or his purple, yellow and chartreuse shoes anymore, as he'd celebrated the removal of his orthopedic back brace by taking up roller blading, which tells you everything you need to know about road cycling's exuberant, mud-splattered cousins.